What is the Bible Map and who is Leon Bates? 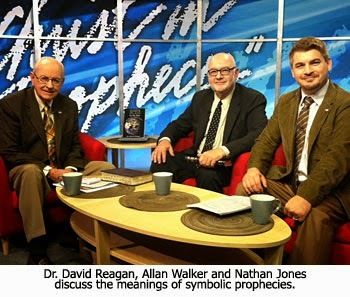 To answer that question, Dr. David Reagan and I on our television program Christ in Prophecy invited Allan Walker of Allan Walker Ministries from Nowata, Oklahoma. Allan has been traveling throughout America for over 20 years teaching what he calls "Bible Prophecy 101" or "The Fundamentals of Bible Prophecy." Dr. Reagan: Allan, you have a wonderful chart that's called the Bible Map. It's so simple and easy to understand and people can get it free of charge through your website. The chart was originally developed by a man named Leon Bates, right? Tell us more about Leon. Allan Walker: Leon Bates was one of the pioneers among Pre-millennialism. His charts have been used in movies from the 1970's about Bible prophecy. Millions of copies of the Bible Map have been translated into various languages. I first saw his Bible Map in 1974 and it changed my life, because it helped me to see that there was a systematic plan to the Word of God. Leon's teaching of the Bible Map helped me to correlate the main people and events of Scripture and get a working knowledge of the whole counsel of God's Word. Dr. Reagan: The Scofield Bible came out in the beginning of the 20th century from a pastor by the name of Scofield. His study Bible was published by Oxford Press of all publishers. During his time there was a man named Clarence Larkin who created incredible illustrations of Scripture. You can still get them today. Then there was a big gap and it wasn't until the 1970's when Leon Bates, who realized the importance of visual aids once again, began to use illustrations to teach about God's plan for the ages and also about the Rapture of the Church. The very first pamphlet I ever ran across about the Rapture of the Church was one made by Leon Bates. I'd been going to church for 35 years and never once had I heard the word Rapture. If you'd asked me what the Rapture was after going to church for 35 years, I would have said it was a sensation you felt when you're girlfriend kissed you! When I first ran across this little pamphlet, I thought, "What in the world! Is this guy crazy? Is he some kind of nut? Is this some sort of cultic group?" Then I started studying the Bible and found out the Rapture is mentioned all through the New Testament. It was all because of Leon Bates. Allan Walker: Scripture speaks line upon line, precept upon precept. I like to think of Bible prophecy as a giant jig-saw puzzle. If you get your jig-saw puzzle put together, but you still have pieces missing, then you've got something out of place. The same goes for prophecy. You have to get all the main people, events, the Jews, the Gentiles, the Church, the Kingdom, the Law and Grace and then put them together like the puzzle before the Bible will make sense. Dr. Reagan: And, you must not get into nonsense like Replacement Theology which says the Church has replaced Israel and God has no purpose left for the Jewish people. Allan Walker: Absolutely! Romans 9 through 11 makes it very clear that God has a permanent plan for the nation of Israel, and the Devil is well aware of that. There's great conflict stirred up in the Church and in the world today over these very issues. These issues are fundamental to understanding the Word of God. Nathan Jones: It's so important to have the 30,000 foot view, where you look down from on high so that you can see all of God's plan in one shot. We often get stuck in our view looking at the Bible from down here. At the 30,000 foot view, we see that when man was first created and lived in the Garden of Eden he walked with God. We can see all the dispensations lined up. As you go through each dispensation you'll see that God reveals more and more about Himself, even to the point where we are living with Christ in the Millennial Kingdom. But then, in the eternal state, we are back walking and talking in perfect fellowship with Father God again, just like in the Garden of Eden. Mankind has gone full circle. In the third segment of this series on Bible Prophecy 101, Allan will reveal some of the major signs that point to the fact that we are living in the end times.